Pixar just released a teaser for next years feature Brave (previously titled The Bear and the Bow) along with some character designs. My favourite are actually Lord Macintosh and the Wise Woman as they are much more graphic than the other character. As a matter of fact I have decided to model those two in order to better understand the Pixar style and improve my modeling skills. I modelled Lord Macintosh in Maya starting from a plane and using the edge extrusion technique in order to quickly create some edge loops then refined the base shape by cutting faces, merging and moving vertices around. Nothing too fancy. I have some experience with that type of modelling but I think I will try the Zbrush approach for the Wise Woman. My friend Richie just showed me the work of Tom Parker, an incredible Zbrush modeler that can knock out a piece in less than two hours. Here is the timelapse, I only recorded the first few hours as the final “vertex cleaning/edge rerouting” pass is too tedious to watch. I hope you will find this interesting, the video is a sequence of automated screenshots hence the choppiness. I really want to like that school and the rigs seem like a lot of fun but I am finding the concept difficult to understand at the moment, is it an animation, modeling, rigging or a generalist school? As a graduate from Animation Mentor I might be interested to join some of the animation classes but the website is making it pretty difficult to understand whether this is possible. Also having two separate domain names 3dappeal and AnimSchool is not helping. One thing for sure is that the guys are uber talented though and those following videos they recorded are very interesting. Christian Dan, one of the crazy talented animators who worked on Planet 51, just made me aware of a great video interview Arte y Animacion recorded with Pocoyo creator, Alfonso Rodriguez. 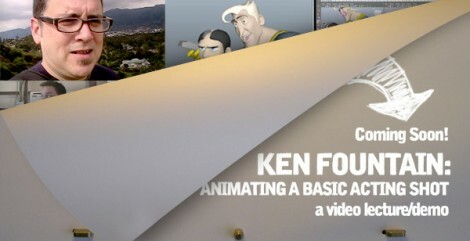 Hehe, Jason Ryan Webinar animation already announced a new Video tutorial with my fellow Animation Mentor student Ken Fountain. During Animation Mentor, Ken always shown a great understanding of performance and entertainment so it wasn’t a surprise when he landed his first character animation job at Dreamworks in 2008. 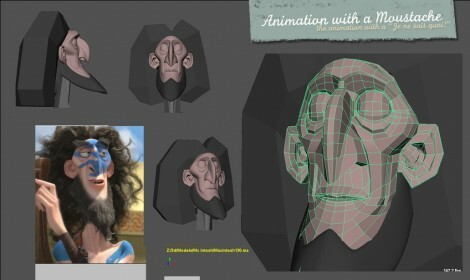 For those who can’t afford Animation Mentor or Ianimate, here is one new video you should and I should be saving for! Monstre à Paris french trailer! That’s it! There won’t be any more delays, the movie is coming out at the end of the year and Europa corp finally released a trailer in french. 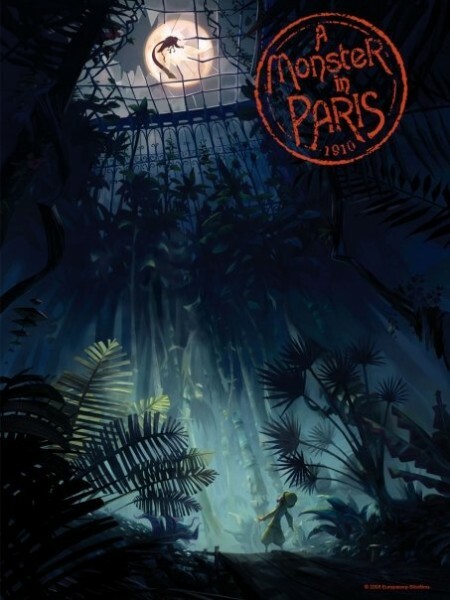 I feel that “Monstre à Paris”, a movie that was first started in 2007, is showing a bit of age compared to animated blockbusters like Kung Fu Panda 2 but hopefully the very stylised art style and european flair will make the movie stand out from the competition. I wrote several posts related to the movie in the past, you should be able to find them all by doing a search on my blog . I am really liking that trailer and the music is very catchy. CG animation lovers are really being spoilt those days! Some more videos on Catsuka. Still don’t know what CTN is? Check out the CTN Vimeo channel. I couldn’t make it last year, this year might be my first. Andreas Deja just started a blog by the way and he is posting some never seen artwork from Disney legends. Deja View. The Ward Kimball sketches he posted are really sweet, too bad the final Three Caballeros shortfilm looked a bit different. Let’s face it, Apple doesn’t care about artists anymore. If they did, they would have released a Tablet PC many years ago. The closest thing you can get to a Tablet PC in the Apple world is Axiotron’s Modbook, a $1849, made to order portable Cintiq. Just for reference, the EP121, Asus latest slate Tablet PC sells for $1,100 with an i5 processor and 32Gb SSD hard drive. I am a Tablet PC fanboy and I have owned 4 or 5 HP and Toshiba Tablets in the last 6 years but with my recent travels I had to cut down on the amount of electronic I carry with me. Currently I have in my bags a two years old mid range HP laptop (DV7) which I use as a workstation, and a Samsung N110 Netbook for my web browsing pdf reading and light computing. With nearly 10 hours of battery, the netbook is great for train/plane trips but I am really missing digital sketching and a proper ebook reader like the Kindle would be awesome so what is the solution? Well Asus came up with a new device called the EEE Note or EA800. So what is the deal with the EEE Note. The EEE Note is $200 only, can be recharged through a mini USB cable (no extra charger needed) works as an eBook reader and hides a Wacom board which makes it a great digital sketching software. It can sync with your PC and can also be used as a Wacom Tablet when connected to a Windows 7 computer. Asus EEE Note review by an artist. She also posted a video showing how to draw with the EEE Note. The device doesn’t seem to be available outside Asia for the moment but if enough people show interest, they might change this. I also wanted to talk about eBook readers today. My friend Richie just bought the $130 wifi version of Amazon’s kindle and it is a really sweet device. There is also a $180 3g version that could also take a huge market share thanks to its free 3G connection. Yes you read it right, there is no rip-off monthly fee but obviously that’s only to download books from the Amazon website or check Wikipedia. I have had the silly idea of starting to read Leonardo Padura’s latest 600 pages novel and an ebook version would have been much easier to carry around, along with my other favourite books. Also, if like me you tend to write a lot of notes or highlight text in your books this is not a problem for the Kindle supposedly. I was watching Tim Ferris latest random show and realised it is possible to highlight text on the Kindle and share this with your friends. Pretty cool I have to say. Sorry for the lack of updates but I am at the Annecy Animation Festival and I am too busy to update my blog. The festival is awesome as usual. We have been really privileged to see some video clips of Aardman latest Stop motion feature “Pirates” and Enrico Casarossa’s short “La luna”. Back to my post. Alexandre from “Mytho Logique” or Mythologique just informed me about the release of their student shortfilm on Vimeo, check it out it is really impressive. “Mythologique” (Mytho Logic for the english speakers) is a short film done by 5 student from french school ESMA for their final year. ohhhhhhh. It just came out! Dreamworks animator extraordinaire, Ianimate mentor and Pencil Test Depot writer Jamaal Bradley just released an Acting shot walk through now available on the JRA webinar store. For those who don’t know, Jamaal previously worked at Sony then on Disney’s Tangled where he did some of the most impressive shots. The video is only $29.99, I just bought it myself and can’t wait to receive the download link!